UPDATE 10:15 a.m.: Webb announced Tuesday evening that he is declining to accept the award because a "small but vociferous group" of women were threatening to disrupt the ceremony. "Over the past few days the decision by the Naval Academy Alumni Association to include me as a recipient of this year's Distinguished Graduate Award has been protested by a small but vociferous group of women graduates based on a magazine article that I wrote 38 years ago," Webb said in a statement posted to his website. "While this article was controversial, many of these protests have wrongly characterized my reasons for having written it, my views of women, and also my record of government leadership in addressing opportunities for women in the military and in our society." Webb said the protests from female graduates were "particularly ironic" because the same women who are criticizing Webb "benefited so greatly from the policies I unilaterally put into place in 1987." Webb said he did not apply for the award but was nominated by his fellow classmates as the "most decorated combat veteran" of the 1968 class, and becoming the first Naval Academy graduate in history to serve in the military and then become secretary of the Navy. While defending himself with several statements from female graduates praising his record, including Juliet Beyler, deputy assistant secretary of the Navy, Webb said the threat of a disruptive protest during the ceremony resulted in him declining to accept the award. "From conversations with the Alumni Association, including information passed down from top Navy leadership in the Pentagon, it is clear that those protesting my receipt of this award now threaten to disrupt the ceremonies surrounding its issuance," Webb said. "I am being told that my presence at the ceremony would likely mar the otherwise celebratory nature of that special day, and as a consequence I find it necessary to decline to accept the award." Female U.S. 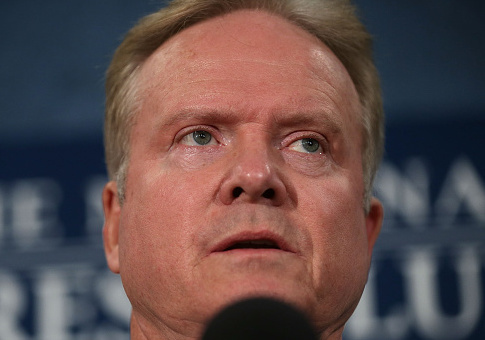 Naval Academy alumni are protesting an award given to Jim Webb, a decorated Vietnam veteran, former senator, and secretary of the Navy, because he argued against women in combat nearly four decades ago. Webb is set to receive the Distinguished Graduate Award this Friday, but several women are asking the alumni association to rescind Webb's award because of his essay "Women Can't Fight," according to the Capital Gazette. Webb received the Navy Cross, the Silver Star Medal, two Bronze Star Medals, and two Purple Hearts for his service as a rifle platoon leader in Vietnam. He later went on to serve as secretary of the Navy under Ronald Reagan before resigning over budget cuts to the Navy in 1988, and as a U.S. senator from Virginia. The Distinguished Graduate Award honors alumni for their "unselfish commitment to a lifetime of service to our nation," "personal character," and those who have made "significant contributions as Navy and Marine Corps officers, or as leaders in industry or government." One female retired Navy commander said the announcement of Webb's award was a "hit to the gut," while another graduate said Webb's essay that argued against women in combat caused "harm" to female classmates in the 1980s. "We would go months without bathing, except when we could stand naked among each other next to a village well or in a stream or in the muddy water of a bomb crater," Webb begins his essay, which was published in 1979. "It was nothing to begin walking at midnight, laden with packs and weapons and ammunition and supplies, seventy pounds or more of gear, and still be walking when the sun broke over mud-slick paddies that had sucked our boots all night. We carried our own gear and when we took casualties we carried the weapons of those who had been hit." Webb argues that men are better suited for war, as he witnessed in Vietnam. "We became vicious and aggressive and debased, and reveled in it, because combat is all of those things and we were surviving," he wrote. "I once woke up in the middle of the night to the sounds of one of my machinegunners stabbing an already-dead enemy soldier, emptying his fear and frustrations into the corpse's chest. I watched another of my men, a wholesome Midwest boy, yank the trousers off a dead woman while under fire, just to see if he really remembered what it looked like." While he said there is a place for women in the military, Webb argued they should not be in combat roles. "Civilian arrogance permeates our government," he wrote, adding the military had become a "test tube for social experimentation." One issue the Capital Gazette noted with the essay was a single line in Webb's over-7,000-word essay that called the dormitory Bancroft Hall a "horny woman's dream." Webb said at the time Bancroft Hall housed 4,000 male midshipmen to only 300 females, and many females who left the Academy married midshipmen. Retired Navy Cmdr. Laureen Miklos wrote to the Naval Academy Alumni Association protesting the selection of Webb, saying Webb's essay was a "living document." Miklos said upperclassmen used the essay to order female classmates to stand at attention and yell, "I am not a horny woman, sir," the Capital Gazette reported. Kelly Henry, another 1980s graduate, wrote to criticize the award, saying Webb's essay caused "harm." "The women will tell you that article was like throwing gasoline on the fire," said Henry. Henry said the essay did not cause any repercussions for women during her time at the academy, saying she was "lucky" because she was in a company that welcomed female midshipmen. Webb told the Capital Gazette that he did not regret debating the issue, and that the essay was a "strongly argumentative magazine article" at a time of an intense national debate over women serving in combat. "Clearly, if I had been a more mature individual, there are things that I would not have said in that magazine article," he said in the statement. "To the extent that this article subjected women at the academy or the armed forces to undue hardship, I remain profoundly sorry." Webb, however, also defended his record as secretary of the Navy and senator, and said he commissioned a Navy-wide study as secretary that "opened up more positions to women than any secretary in history." This entry was posted in Issues and tagged Navy, War on Women, Women. Bookmark the permalink.